June 1912 brought summer to Oregon and suffragists took their message to summer events. And they also voted in school elections. June brought the Rose Festival to Portland. 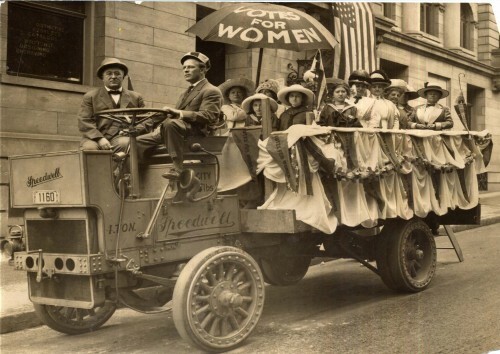 Esther Pohl Lovejoy and Pike Davis used the opportunity to sell sandwiches and suffrage by staffing the Suffrage Lunch Wagon with food and creating a rolling advertisement for votes for women from 12:00 to 2:00 each day of the festival. Suffrage Lunch Wagon, June 1912, Courtesy Amy Khedouri. The Oregon State Suffrage Campaign entered a float in the “float class of the horse and vehicle parade of the Rose Festival” and won first prize (“Pioneer Gets Cup,” Oregonian, June 18, 1912, 18). 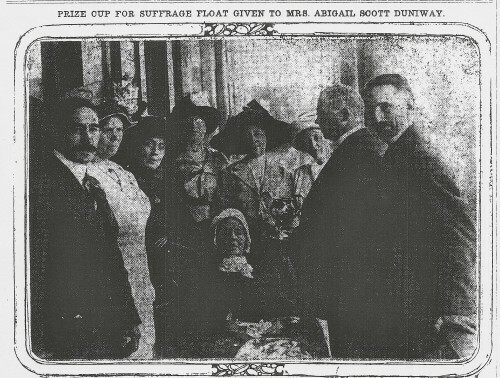 The Oregonian printed an image of suffragists and Rose Parade officials delivering the first prize cup to Abigail Scott Duniway, who was ill and confined to her home. We’re fortunate that the paper printed names in the caption. Archivists—do you have this image in your collections?? Votes for women supporters in Oregon were working to gain support for the November 5, 1912 ballot measure that would provide full suffrage to the women of the state. But many women could vote in school elections. In 1878 the Oregon legislature passed a bill enabling all taxpayers in the state, regardless of gender, to vote in school elections. This was based on the idea that mothers with children and property in a school district had a stake in school board affairs and should be able to vote. Newspaper coverage of school elections in gives us a great sense of what that vote meant in 1912. In Portland, school board candidates courted the woman’s vote. A recently-passed Corrupt Practices Act, designed to prevent undue influence over voters on Election Day, did not apply to school elections. So on June 17 “friends of both candidates” used cars to gather voters and bring them to the polls. According to this Oregonian article, “The automobiles were used principally in the outlying districts and were largely responsible for the heavy vote that was polled.” The candidates, of course, were banking on women and men who received a ride to vote for them and perhaps put pressure on them by asking about their choice ahead of time. “Beach Reelected to School Board,” Oregonian, June 18, 1912, 14. “The voting for director and clerk will take place at the school house,” he noted. “It should be remembered that women already have the privilege of suffrage in school elections. If all the women of the community will pack their lunch boxes, and assemble at the school house on the morning of June 17, I am confident that the men will be there also when the sun reaches the meridian. Of course, the members of the family under voting age will have to have dinner. So all will spread out their lunches under some pleasant shade, and enjoy dinner together.” Voting, Alderman said, would definitely not interfere with women’s family duties, a charge made by antisuffragists. L. R. Alderman, “To the Patrons of Oregon Schools,” Madras Pioneer, June 13, 1912, 2. By May 1912 suffrage organizations across Oregon had established a strong foundation and new groups were forming to bring the votes for women message to male voters in their communities. Activists in Portland’s African American community formed the Colored Women’s Equal Suffrage League on May 13. Endorsements of woman suffrage by existing organizations also brought potential voters to the cause. On May 18 the delegates to the Oregon State Grange convention in Roseburg voted to support woman suffrage in the state. And when the press covered these events valuable publicity expanded awareness of the movement. African American women in Portland had established the Colored Women’s Council of Portland three months earlier, part of a growing number of African American women’s clubs across the nation. At a meeting of the council on May 12 members decided to form a suffrage association for women who were members of Portland’s five African American church congregations. Their goal was “spreading equal suffrage ideas among those of the race.” Katherine Gray served as the first president of the Colored Women’s Equal Suffrage League with Mrs. Lancaster as vice president, Edith Gray as treasurer and Hattie Redmond as secretary. Redmond later served as president. The CWESL worked within the African American community and also as part of the coalition of suffrage groups in the city, including the State Suffrage Central Committee. “Equal Suffrage Endorsed by State Grange,” Oregon Journal, May 18, 1912, 6. 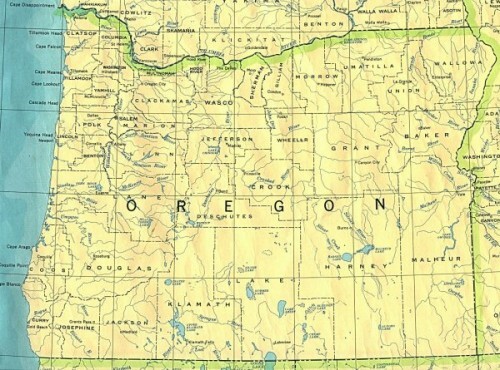 The Oregon State Grange, a social and political organization representing farmers, had been an important supporter of woman suffrage in Oregon and other state Granges had supported votes for women in other western states. The national Grange waited until 1915 to endorse the suffrage cause. “‘Whereas, The social relations of the family and state have from the beginning of the history of the human race shown man and woman, through of different spheres of activity and frequently of different viewpoints, to be essentially necessary in the social, economical and intellectual welfare of the home, the community, and the state. May 1912 marks a milepost in both the growth in individual organizations appealing to voters within specific communities, as was the case with the Colored Women’s Equal Suffrage League, and endorsements from organizations representing particular constituencies such as the Oregon State Grange. Each group made important contributions to the 1912 Oregon suffrage victory with appeals to particular male voters in their communities. Just as vital were their contributions to a broader vision of equality in Oregon. Members of the CWESL contributed to the coalition of suffrage groups and were part of the umbrella organization of the State Suffrage Central Committee. They also worked to achieve an end to discrimination by gender and an end to discrimination by race. The Grange resolution certainly targeted the votes of male Grange members. But the assembly also urged “all those persons who now exercise the right of citizenship” to support woman suffrage. The votes for women victory in 1912 was the result of a statewide effort, coalition building, and activists’ willingness to adopt mass campaign tactics to reach every possible voter. In April 1912 Hood River was a hotbed of activity for woman suffrage. 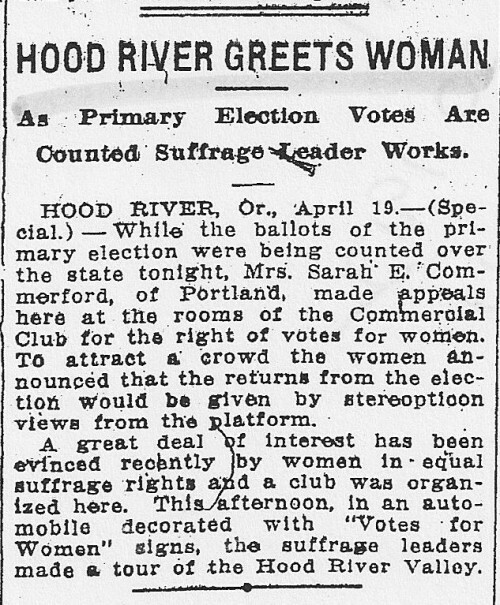 “Hood River Greets Woman,” Oregonian, April 20, 1912, 11. Activists used the evening of the return of the primary election ballots to publicize the votes for women measure on the ballot for the general election in November. As the Oregonian reported, Portland suffrage lecturer Sarah Commerford came to Hood River and, at headquarters in the city’s Commercial Club, appealed “for the right of votes for women.” Savvy Hood River suffragists used popular technology and made the most of the occasion by announcing the results of the primary by stereoopticon (magic lantern slides) “from the platform” of the Commercial Club. Hood River had greeted woman indeed. Support for votes for women was growing across the state of Oregon in March 1912. Thanks to the Oregon Digital Newspaper Program we have information from the Klamath Falls Evening Herald about a Lake County invitation to future women voters. From the Malheur Enterprise, published in Vale, Oregon, came editorial musings about suffrage, borders, and progress. On March 11, 1912 the Klamath Falls Evening Herald, published in Klamath County in Southern Oregon, quoted a story from the Lake County Examiner with an invitation to future women voters in Lake County. 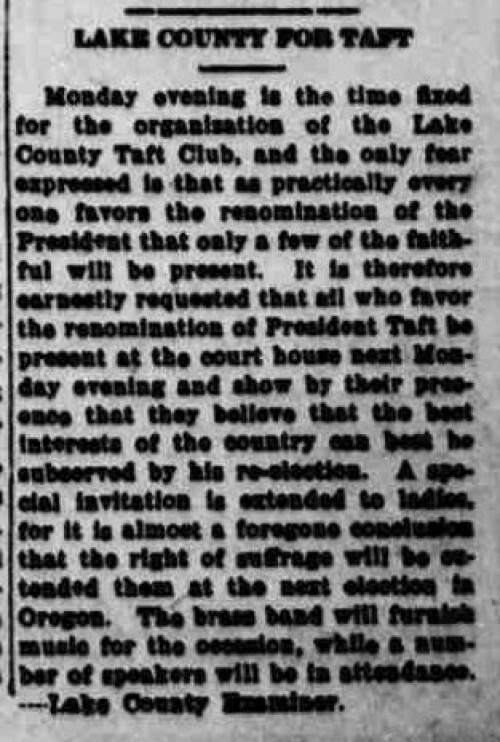 “Lake County for Taft,” [Klamath Falls, Oregon] Evening Herald, March 11, 1912, 1. In Vale, less than fifteen miles from the Idaho border in Eastern Oregon, the editors of the Malheur Enterprise noted the steady progress of woman suffrage sentiment. 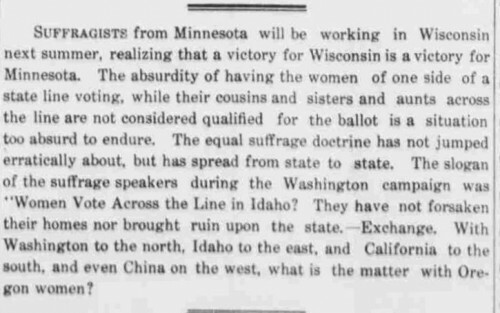 “Suffragists in Minnesota . . .” Malheur Enterprise, March 30, 1912, 4. Writing about Minnesota and Wisconsin, but with an eye on Oregon and near neighbor Idaho just fifteen miles away where women had been voting since 1896, the editors noted: “The absurdity of having the women of one side of a state line voting, while their cousins and sisters and aunts across the line are not considered qualified for the ballot is a situation too absurd to endure.” Support for votes for women, they argued, had “not jumped erratically about” but rather “spread from state to state.” Washington State suffragists, in their successful 1910 campaign, had pointed to Idaho, where voting women had “not forsaken their homes nor brought ruin upon the state.” Oregon was now surrounded by suffrage states in 1912. There was the possibility of women in the new Republic of China gaining the vote (something that did not come to fruition but was an important transnational hope for Chinese American women and other suffrage supporters). It was time for Oregon women to gain this right, the editors suggested. Could male voters really claim that there was something the matter with Oregon women? 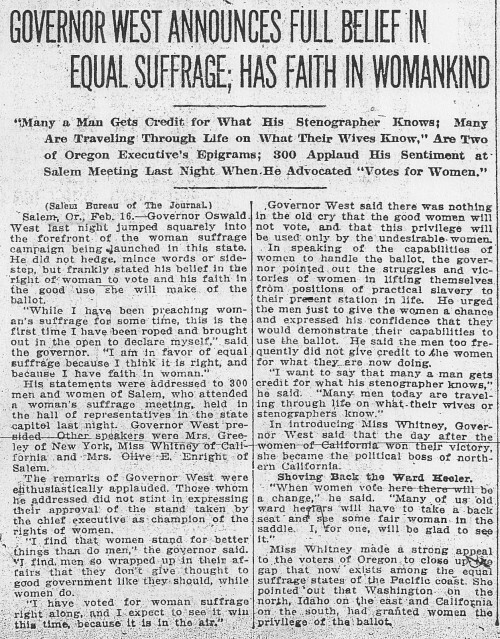 “Governor West Announces Full Belief in Equal Suffrage; Has Faith in Womankind,” Oregon Journal, February 16, 1912, 1. “Governor West Firm Friend of Suffrage,” Medford Mail Tribune, February 17, 1912, 2. Governor Oswald West’s support was vital; it also reflected the growing number of men—in public office and policy positions but also in various communities and occupations—who supported votes for women in Oregon in 1912. Suffrage supporters were thrilled with West’s remarks and formal support, and it seems more than likely that stenographers (who formed their own suffrage league in August 1912) would have been particularly delighted with his speech.